And before you ask, sorry, I don't know where you can get them, we just generously borrow from our Flickr posters. Then on the upper right she links to things currently for sale. Her little cakes come in pastels and now adorable christmas ones! Ohhh I just adore her cupcakes! 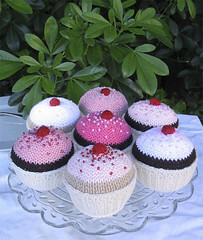 they are by far the sweetest knitted versions I have seen...perfect in everyway! !